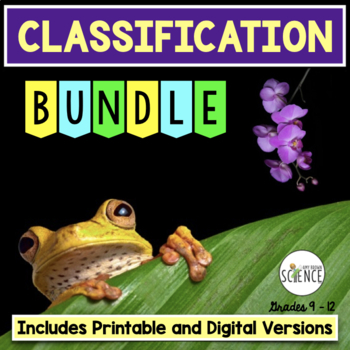 Classification and Taxonomy Complete Unit Bundle. 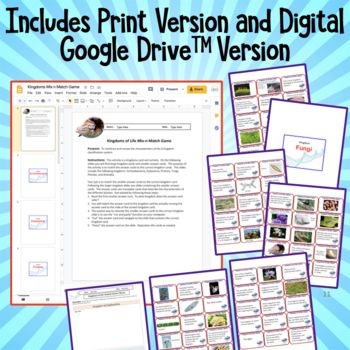 Includes powerpoint, labs, dichotomous classification keys, classification task cards, kingdoms mix/match card sort game, homework assignments, review games, crossword, quiz, and unit text. Includes everything you need right at your fingertips for a complete unit on taxonomy and classification. This bundled unit contains at least 2 weeks of teaching materials or 3 weeks if you complete all of the enclosed labs. For Even Greater Savings: This complete unit bundle is included in my "Full Year Biology Curriculum Bundle." Click the link below to view this bundle. • Student notes outline: Student completes their outline as the lesson is being taught. 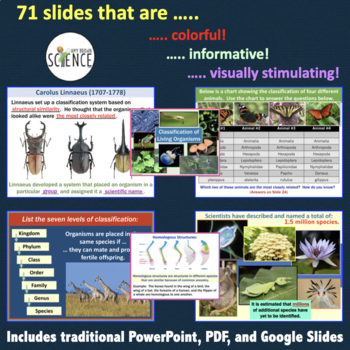 • Lab: Let's Learn to Use and Build a Dichotomous Key! • Lab: Let's Build a Cladogram! Each of these products is sold separately in my TpT store, but buying the entire unit in one download will save you money. If each of these products were purchased separately, the total cost would be $46.98. The bundle is sold at $34.99,which is a 25% discount. • The need for a system of classification. • Summary of Darwin's Theory of Evolution. • Early attempts at classification: Aristotle, misuse of common names. • Linnaeus: Seven levels of classification, binomial nomenclature, definition of species, the rules of binomial nomenclature. • Modern taxonomy: phylogeny, phylogenetic tree, reading a phylogenetic tree, practice questions. • Homologous, analogous, and vestigial structures. • Modern taxonomy is based on: structural similarity, cellular organization, evolutionary relationships, biochemical similarities, genetic similarities, embryological similarities. • Cladistics and cladograms: Definitions. 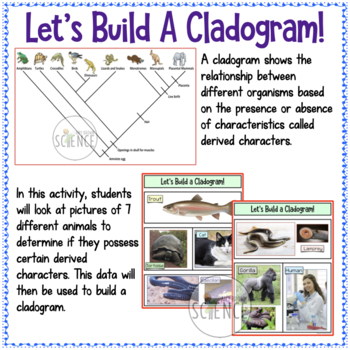 • Cladistics and cladograms: Students will look at a cladogram and answer questions about it. • History of the Kingdoms: 2-kingdom system, 3-kingdom system, 5-kingdom system, and the 6-kingdom system of classification. • Three domain system of classification. • Comparison of kingdoms in the 6-kingdom system. • For each kingdom, students learn the characteristics of the kingdom. Many picture are included as examples. • Mechanisms that serve as barriers between the species. • The dichotomous key to classification: Students will learn how to use a dichotomous key; Students will classify the leaves of 7 trees using a dichotomous key. When appropriate, I have included each product as an editable Word document, and I have also included each product in pdf form. Below is a complete list of what you will receive. You can click on each link to read a detailed description of each product. Activity: Let's Build a Cladogram!